Causing more cancer deaths than any other cancer of the female reproductive system, today I’m joining a nation-wide initiative this September to promote ovarian cancer awareness. Ovarian cancer is not as publicized as other female cancers for many reasons, including low survival rates. That’s why it is important to get regular pelvic exams and pay attention to the smallest unusual symptom. Those who know me well know why I’m very passionate about this cause. One of my family members had a close call with ovarian cancer. Today, she is in her fifth year of remission after being diagnosed with stage four of the deadly disease. We were indeed lucky, but others are not as fortunate. Often called the “silent killer”, ovarian cancer is almost impossible to detect as symptoms are often disguised as common illnesses. Symptoms often include bloating of the abdominal area, constant need to urinate, pelvic or abdominal pain, or unusual vaginal discharges. Women should have rectovaginal pelvic exams on an annual basis and not to confuse it with PAP smears. “The two are very different exams. PAP smears only check for cervical abnormalities. In addition to rectovaginal pelvic exams, there is also a CA-125 blood test that measures the amount of certain protein that is often elevated with ovarian cancer, and a transvaginal ultrasound. True with any cancer, ovarian cancer survival rates are especially important as nearly 70 percent of women have an advanced stage of the disease when they are diagnosed. Ovarian cancer is common in older women. Most patients are older than 60 and post-menopausal. Studies have also shown that women who have not had children are at higher risk. Other risks include having a family history of the disease and a history of cancer involving the breast, uterine and colorectal. There are several treatment options for ovarian cancer including surgery and radiation or chemotherapy. Gynecologic oncologists, doctors who have special training in cancers of a woman’s reproductive system, can work with each patient for the best treatment option based on age, health and cancer stage. If you or a loved one have not been screened for ovarian cancer, please contact your physician today. Don’t fall victim to the “silent killer”. Trust me. 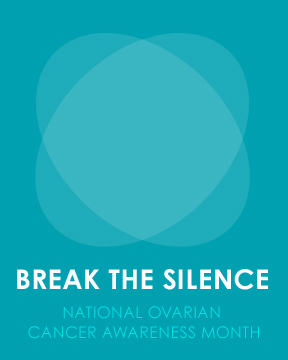 For more information or to learn how you can help break the silence on ovarian cancer, please visit the National Ovarian Cancer Coalition at www.ovarian.org.